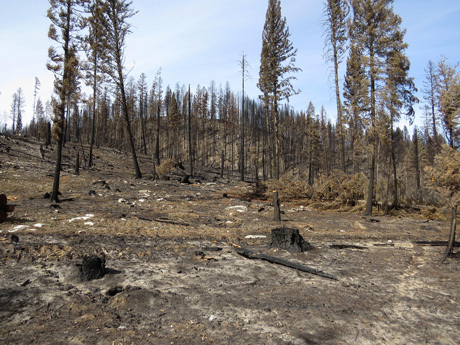 Wildfire-prevention logging often burns anyway, leaving stumps instead of snags essential to wildlife. Flathead National Forest, 2015. We need your help TODAY to stop Congress from attaching damaging logging riders to the pending must-pass spending bill! 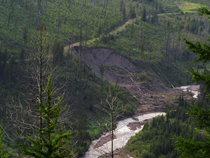 Pro-logging members of Congress, including a number of western democrats, are attempting to boost logging, boost "collaboration" and weaken public environmental review of logging projects. This is being done by attaching controversial, secretive "riders" to the upcoming must-pass Appropriations Bill! The Forest Service supports streamling the National Environmental Policy Act to speed up logging projects, largely delegating NEPA's widespread public involvement to small groups of local collaborators. Companion authority to increase Congressional funding of private "collaborative partners" is also being sought! In other words, Congress is trying to take another giant step behind closed doors to buy "public support" for damaging logging projects, leaving most American citizens behind! Please call the Capitol Switchboard RIGHT NOW at 202-224-3121! They will direct your call so you can leave a message for your Senators and Representatives to not allow logging riders to be attached to the Appropriations Bill! Or, you can find your Senators' Contact Information HERE and your U.S. House of Representative's Contact Information HERE! Please also call the White House at 202-456-1111 to help insure President Obama does not follow the Dept. of Agriculture and Forest Service down this disasterous path! You can read about the pending riders to the Appropriations Bill at http://www.eenews.net/stories/1060029355 . THANK YOU for taking a few minutes to ACT TODAY!